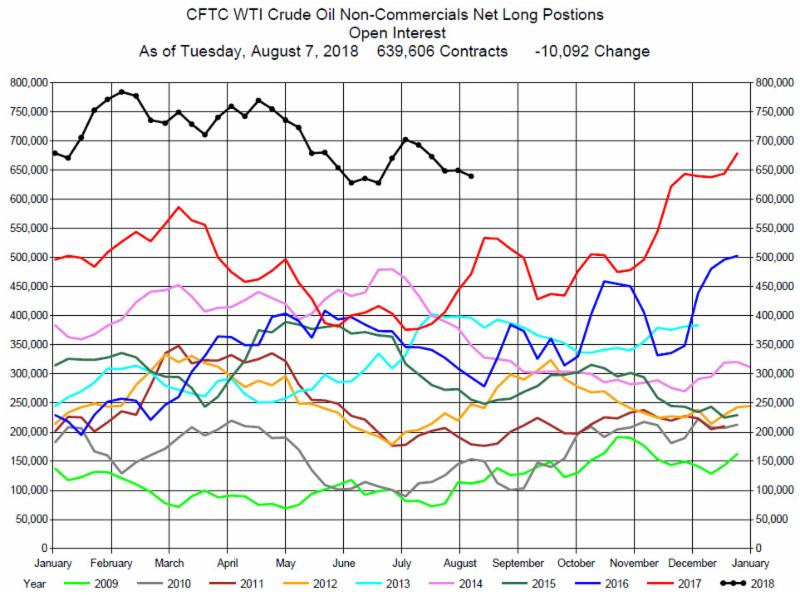 The latest CFTC Commitment of Traders Report as of Tuesday, August 7, 2018 shows the Non-Commercials Net Long Positions decreased during the week by 10,092 contracts to 639,606 contracts. 10,027 Long positions were closed and 65 Short positions were established. This is the 4th decrease in the last 5 weeks, so it may represent a re-positioning of the Funds Net Long Positions should there be a dramatic price decline. The latest data is through Tuesday, August 7, and on Wednesday, August 8, Crude Oil prices dropped by a significant $2.50. So it will be interesting to see if the price decrease is reflected in the next CFTC report. Crude Oil prices remain range bound between $67 and $70. When prices definitively break out of the range, we expect the Funds to adjust their Net Long Positions accordingly. As we have mentioned before, the increased participation by the Funds in the Crude Oil market will add to the momentum of the established price direction.